July 17, 2018 – AFL England have been unveiled as strategic partners of CrossCoders, a global program that will allow top female athletes a once in a lifetime opportunity to become a professional in Australia’s premier football league. Over the next couple of months the CrossCoders team, supported by AFL England, will embark on a journey to find elite female athletes from around the world. 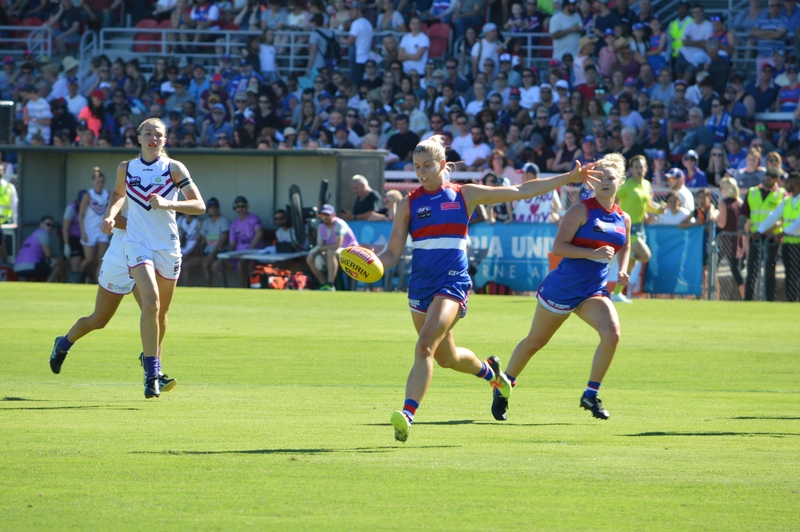 From an estimated 100+ athletes at an AFLW International Rookie Camp, the aim will be to narrow this down to one rookie to form part of the Western Bulldogs AFLW squad for 2019. CrossCoders founder and AFL England President Jason Hill said that he was delighted that women across England will have the opportunity to join the professional game in Australia. “It is a passion of mine to see more women from around the globe have the option to play the sport professionally and also to spread the wonderful game of Australian rules football to the world. CrossCoders has the full support of the Western Bulldogs AFLW and they are working closely with the club to secure appropriate connections are made with existing supporters, like Victoria University, to provide a unique opportunity to support ‘the dream’ of any successful applicant. Over the next couple of months, CrossCoders will be looking for applications for the program to be invited out to Melbourne, Australia to be put through their paces by Western Bulldogs Premiership winning coach Paul Groves. AFL England Head of Women’s Sport Laura Turner says views the program as an amazing opportunity for talented international women to potentially play footy at the highest level. “There is so much talent coming through,” says Turner, “And many women are desperate for the opportunity to showcase their skills. Head of Junior Development at AFL England Hannah Winsbury believes the partnership could have lasting consequences for young female players up and down the country. Head of Club Development At AFL England Laura Woodruff says that it’s a fantastic opportunity for women to try something new and find that hidden talent.